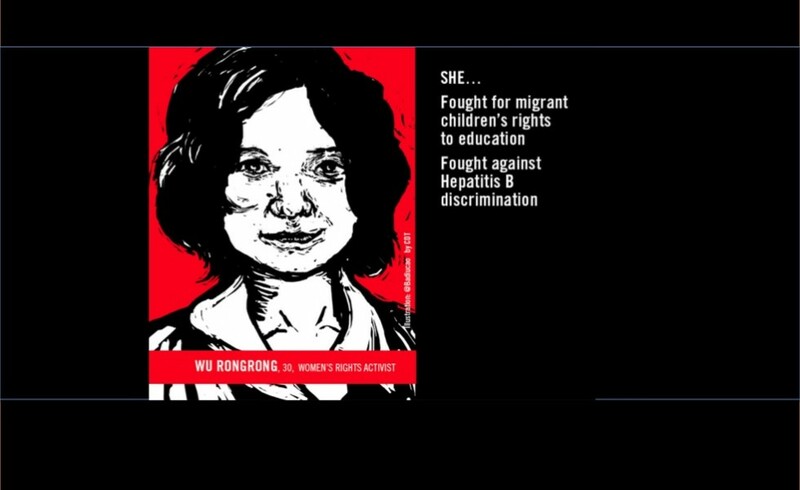 Wu Rongrong, one of the Chinese Feminist Five has talked about her suffering during the police interrogation and her detention. The author of this article prefers to remain anonymous. Recently, I was blessed to meet up with Wu Rongrong, one of the “Feminist Five” in Hangzhou, China. On April 13, Ms. Wu was sent back to Hangzhou by Beijing police under the condition of “on bail awaiting trial”. I organized her own narratives about what she has gone through into this article. There will be sub-sectional titles with question marks below. That’s because the article is written based on Ms. Wu’s own narratives only. I do believe Ms. Wu was telling the truth, but since I did not interview the police, I use the question marks here to demonstrate certain objectivity for the article here as it is based on Ms. Wu’s unilateral story. Such a question mark could be also considered as a form of “procedural justice” in writing and reporting. “But we were not able to make it eventually. At around 2:00pm on March 7, I was taken away by the police in Xiaoshan Airport. At 11:00am the next morning, I was taken to Beijing and had detained in the Haidian Detention Center ever since then.” Ms. Wu told me, “As a matter of fact, on the morning of March 06, I got the call from the Guobao in Hangzhou (the policemen from the Department of State Security). They asked me to stop the activity and I actually agreed to do that at that moment.”Ms. Wu believed that she was detained by the police due to their activity plan on March 07. “Occupy Men’s Room” – the Old Activity Two Years ago Becoming the New Charge? According to Ms. Wu, “Occupy Men’s Room” in the early spring of 2012 was the performance art conducted by feminist activists in Beijing and Guangzhou. Their activity did not really take over the men’s room, but took the form of performance art demonstrating their concerns for the disproportional ratio of women’s and men’s rooms. They aimed to solve the social issue that women have always had to wait for a long time in a long line for using the public bathrooms. The activity was actually conducted in this way. They found a public bathroom, firstly explained to the men who were going to use the bathroom about their activity and only after they got the consent from those men did they symbolically “occupy” the men’s room for 10 minutes (and let the women who were waiting for a long line for the women’s room next to use the men’s room instead). They also held a sign writing “Protection of Women’s Rights” outside of the public bathrooms. And that’s it. Humiliated, Threatened and Insulted during Interrogation in Detention Center? ID was “made lost” by the police?